Below Deck Season 4 premieres tonight on Bravo at 9/8c. 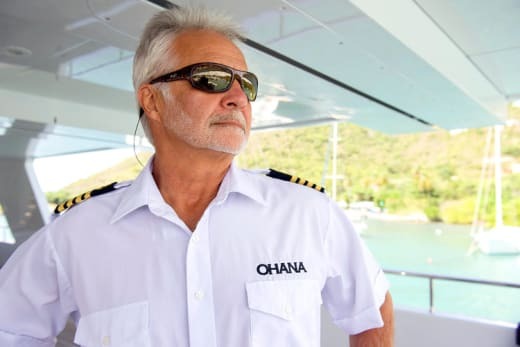 In anticipation of the show's return, TV Overmind spoke to Captain Lee, the man who oversees this yacht-based reality show, asking him about his past... what happens off camera... and what is on tap in the weeks ahead. On becoming a Captain: I was living in the Turks and Caicos Islands, running a restaurant and was offered a freelance gig helping to deliver a sailing yacht down island. With my spirit of adventure taking over I jumped at the opportunity and when I came back I told my wife that a career change could possibly be in order and that is where it all started. On a crazy, albeit thoughtful, event that took place off-camera: [It] would probably be one of the crew, who shall remain unnamed, imbibing too much one evening and falling asleep, so to speak, at the table. When it came time to close the restaurant, they couldn’t wake this person up so they sprayed this crew member down with bug spray and left this person there to sleep it off. On the "great" season ahead: We have a stunning vessel, great guests with some unusual requests, and some crew that add to the excitement of it all with their behavior, good and bad. Great location for this year and we got some really unique shots of everything... I think this may be the best yet. For more from Lee, including which other reality series he would like to appear on, VISIT OUR FRIENDS AT TV OVERMIND.